I think it's official: after years of vacillation and procrastination, I've finally committed to ring-bound notebooks as my preferred way to stay organized. I have for years now irregularly switched back and forth between ring-bound notebooks (mostly those of Filofax and Succes) and hard-bound notebooks (mostly Circa, Moleskine, and Leuchtturm1917), never quite being able to decide once and for all which best suits my needs. 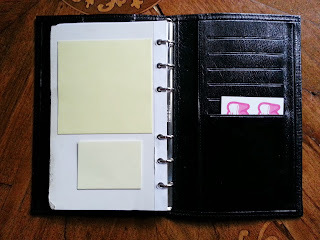 Most recently, I forced myself to use, for the better part of a year, hard-bound books both for the small, in-my-pocket, just-in-case kind of book as well as the larger, take-to-meeting and think-deep-thoughts kind of book. (In case you want to know, I was using a pocket sized Leuchtturm1917 softcover, and an A5-ish Legami - kind of an Italian Moleskine knock-off). By doing this, I was able to quite crisply decide what the most important and unavoidable requirements are, for me, in a good book. I want to be able to reorganize the pages. That is, I like to group pages by topic. Personally, I find it easier to search for information later. This gets rid of the need to "tag" pages, and track continuation pages, etc. I keep both temporary notes - which will quickly become useless - and long term, journal-like notes. That means that some pages will be full of crap, and others of useful stuff. A hard-bound book mixes those two up. Pages for scratch notes are "wasted" in that I can't use them for more significant stuff. In a ring-bound book, on the other hand, I can just replace spent scratch note pages with fresh new pages as needed. These are my two single more important requirements. Everything else is just icing on the cake if not total fluff. Once I realized that, I also realized I really had no choice but to use ring-bound books. And while I regret having to give up the... pleasure of using a hard-bound book (a pleasure, I note, that I cannot explain at all except to say that I get a sense of importance or significance form a hard-bound book that I find lacking in ring-bound books), I have always been compelled by evidence. And the evidence tells me that without question, ring-bound books are right for me. So now I use a very slender Omega binder (I bought it "vintage" on eBay, and I cannot find others like it). Its rings are small (about 13mm) and its just large enough to accommodate Senior sized Succes sheets. I'll be replacing the larger Legami hard-bound book with an A5-sized binder that I also got from eBay and appears to be from China. I'll blog about that one later. For now I'll leave you with this boring image of my new Omega binder.